Our Bishop, Rev. Thomas Aitken, has described the 30th Annual Synod Assembly of the Northeastern Minnesota Synod as “one of the finest ‘Teaching’ Assemblies ever.” Intentionally planning themes in the past years around Luther’s Catechisms as a way to live more fully into our Evangelical and deeply theological heritage as Lutheran Christians. In this 500th Anniversary Year of the Reformation, we focused on Martin Luther’s great passion for the scandalous and life-giving power of the gospel through Word and Sacrament as the one thing the church stands or falls on. We welcomed guest theologian and keynote speaker, Dr. Richard Carlson, from the Lutheran Theological Seminary at Gettysburg, who underscored the importance of our Lutheran theological perspective and why the sacraments matter. who also attended assembly and assisted in worship. Pictured here with the youngest Lutherans to attend the assembly and their parents. Each morning began with inspirational devotions and each day, we spent time in vibrant worship, which also included the Installation of Assistant to the Bishop Rev. Amy Odgren, the recognition of the new roster of Word and Service and the name of Deacon for those who were formerly known as Associates in Ministry, Diaconal Ministers or Deaconesses, and a joyous celebration of the Joint Declaration on the Way with our Roman Catholic brothers and sisters. Worship offerings went to our synod’s Seminarian Scholarships and Seminarian Debt Relief Funds. And finally, we enjoyed poolside fellowship and Brew with the Bishop, tasting home-brewed craft beers and root beer made by our Bishop and others…even a beer where the recipe matched closely with what Katie Luther brewed for Martin! We elected individuals into positions of leadership on committees supporting synodical ministries and the Synod Council. We approved synod constitutional amendments. Two resolutions were passed: 1) Joining others in explicitly repudiating the European Christian-derived “doctrine of discovery” as fundamentally opposed to the gospel of Jesus Christ, acknowledging and repenting of complicity – and offering a commitment to partner with our Native communities within the synod territory. 2) To stand with suffering Ethiopians and speak out against injustices occurring in Ethiopia. We heard reports from all of our synod staff and from our Synod Women of the ELCA, highlighting the many ministries that we engage in together across our synod territory and throughout the world. We passed the proposed 2018 synod budget of $1,140,700, and encouraged congregations to continue their solid mission support. We learned about Lutheran Social Services and the Center for Changing Lives in Duluth, our Companion Synods, the School of Lay Ministry, hunger, justice, immigration and refugee issues facing our world and the church. Our camps inspired us as they spoke about their energy in getting ready to welcome summer campers this year. We recognized and thanked several clergy and rostered leaders for their many years of service to this church. For me, the most meaningful past of every Synod Assembly is hearing the stories of what God is up to in our congregations when I talk with leaders during breaks, meals and receptions. This year I heard stories of how the “Backpack” food program started by the Trinity, Milaca youth group after the 2015 Synod Journey is expanding beyond their walls because of the need. One youth asked last week, “Can I get some of that food you hide in lockers every Friday? I have nothing to eat on the weekends.” I heard stories from First Lutheran in Buhl, where they are taking risks and finding creative ways to serve the needs of the young families and parents in that area. I heard stories from a man who feels called to use his kayak expertise to equip and support complete strangers as they tackle kayak trips on the Mississippi. All of these stories – and the many more I heard – are living out a culture of faith formation, where relationships, theology, discipleship, engaging parents, leadership development, congregationally owned ministry and contextual programs intersect and launch people into ministries for the sake of loving others in the name of Christ. This changes everything! I invite you to read more on how a culture of faith formation can change everything here. It was a thrill to see so many gathered together to give God thanks for God’s work in the world around us – and to be reminded of how the sacraments give us our foundation, our identity, and all that sustains us as we work together in God’s kingdom. Our surroundings on beautiful Gull Lake and with the font which was front and center as we met for the weekend, made the life-giving grace-filled water of our baptisms come alive. 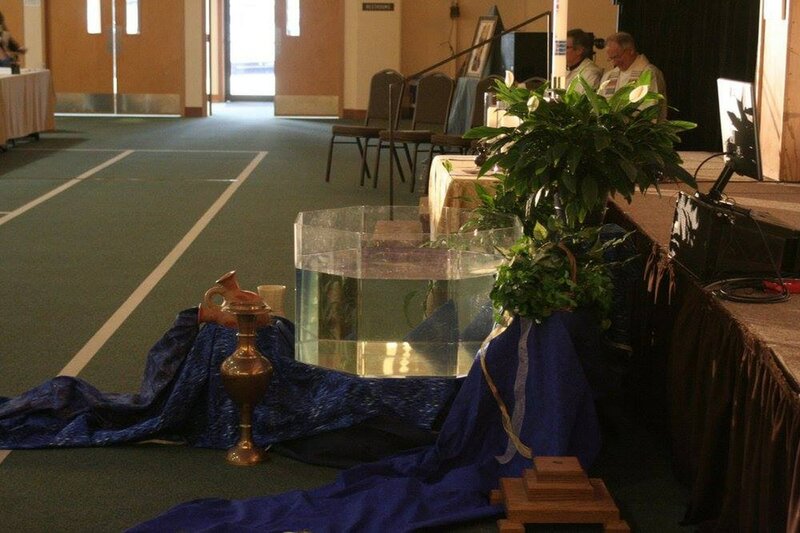 I was particularly moved when our Deans brought water from the various watersheds around the synod to mix and splash within the water in the large font before us. The anointing as a remembrance of our identity as a Child of God was powerful as well. However, it was in listening to the report of Christian Jackson-Skelton, Executive Director of Mission Advancement that I was overcome with gratitude for the generosity of congregations within this church. We learned about all that is possible when hearts are opened to the call to participate in what God is doing to bring love and grace to this world. Millions of dollars are shared from some 900,000 congregations across the ELCA to do God’s work, and it’s amazing! It made me feel proud to be connected with such a vibrant body that makes a difference. I am also proud that this synod is taking the important step in building relationships with our oldest neighbors in Native communities. I pray that God might bless these relationships for future ministries of reconciliation and healing. In my short time in this synod, I have come to respect the many congregations who have taken bold moves to either work in new ways with neighbors or to reconfigure their ministries. It was a joy to recognize them and honor them for their work. And finally, I have to admit, the Marketplace and the quilt sales were a lot of fun! What a good way to meet new folks and rekindle old friendships as we bid and did some friendly “outbidding” for the terrific cause of giving to World Hunger. There were many memorable and moving moments for me throughout the entire assembly. It is always moving to hear from all of you what touched your heart or challenged you to action. I so appreciate the Living in the Word devotions, the opportunities to learn and grow theologically, the reports of what we do together as synod and as churchwide, the challenges as well as the encouragement shared by my colleagues and co-workers, and the worship. Normally, my weekly worship life and participation does not happen with 400+ people in a service. So, to be able to sing and commune together with over 400 people is truly a blessing. What struck me as most serendipitous of all the worship services was the Sunday worship where everyone sang boldly, “A Mighty Fortress is Our God.” Many were singing the words from heart (and loudly so!) and others were singing the words listed in the bulletin, the more modern text. It was amazing to hear the traditional words supporting the four part harmony echoing throughout the Sports Centre coupled with the newer phrases, sometimes hesitant, yet still clearly heard coming through over and above the traditional. At various points in the hymn, both were on the same phrase. Poignant, as we celebrate the 500th Anniversary, but do not remain in the past - moving forward into the next 500 years. Like a Mozart or Bach “two part invention”, the music, text, voices and hearts were woven into one mystic communion of the body of Christ. This was an Assembly of generous giving. A total of $33,072.16 was given during the 2017 Synod Assembly.